Ten TBGS students are celebrating receiving conditional offers from Oxford, Cambridge or Harvard this year. Four of the students received offers from Cambridge for Maths, Architecture, and Engineering (2). 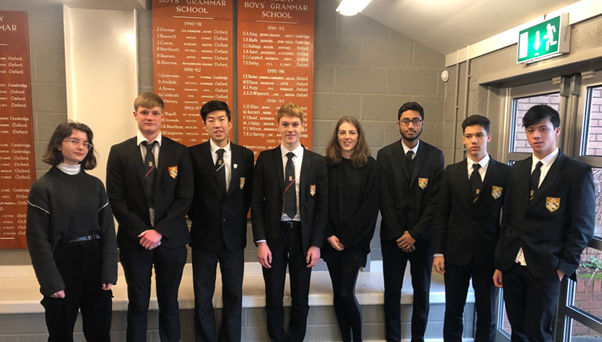 Six students received offers from Oxford for Medicine, Economics & Management, PPE, Experimental Psychology, Archaeology & Anthropology, and History. Justin Chan is our 5th students to receive an unconditional offer from Harvard (with a full scholarship of nearly 300,000 USD). He also secured an offer from Cambridge to study Mathematics but will have to decline this! 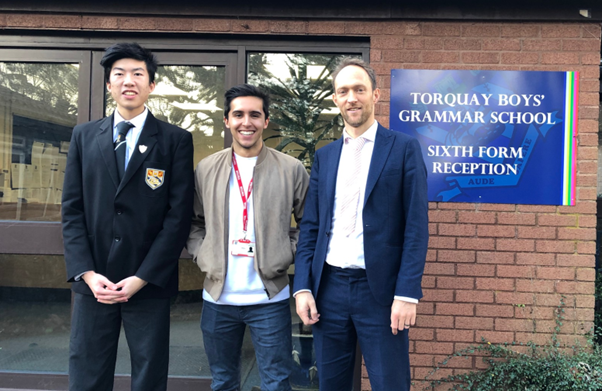 Here he is pictured with Mr Bainbridge and James Bedford who came into school just before Christmas; he is currently in his third year at Harvard. During his studies at Harvard, he has experienced many opportunities including as part of the Harvard College Consulting Group (https://www.harvardconsulting.org/), a Harvard non-profit student group that advises influential businesses and companies on strategic decisions using quantitative and qualitative analysis. These include companies such as Microsoft, Pepsi, and Paramount, among many others. He also set up an induction programme (FYRE – First-Year Retreat and Experience) for new students joining the University who come from low-income, or are the first-generation in their family to attend College (https://fdo.fas.harvard.edu/fyre). James also spent time in Singapore, during the summer holiday as an Intern, gaining valuable work experience. Of the group of ten current students, seven are studying the International Baccalaureate and three are studying A-levels. We again have two female students gaining offers: Laura Green has received her offer to study Politics, Philosophy & Economics, whilst Molly Acheson has an offer to study Archaeology & Anthropology, both from Oxford. We are thrilled with the number of students receiving Oxford and Cambridge offers this year, across such a range of subjects. They are all very deserving and reflect the students’ outstanding work both throughout their time at TBGS, and during the very tough selection process. We have a rigorous support programme which prepares students for each element of the application process including: support with personal statements; an overnight visit to the Oxford open day; entrance test preparation; interview technique workshops; mock interviews and various subject extension groups. We have also been grateful to some of our past students, who have returned from their current study at Oxford and Cambridge, to offer support to prospective students. Credit must also go to the staff that have worked with the students and ensured they can compete successfully at the highest of levels. Pleasingly, we continue to see great success with our potential Medical students, again this year. They have received much support from Mrs Kilpatrick and Dr Bethune, who have run a Medical Society, where students have received many lunchtime sessions covering various medical topics and issues, have experienced MMI mock interviews from Plymouth University, lectures from practising doctors, as well as undertaking work experience organised independently and via the support of Dr Stites. Luke Gribbin, in particular, is worth a special mention. Luke achieved one of the Highest ever UKCAT scores with 3550 out of 3600: to put that into context, a very good score is usually around 2800 and an outstanding score would be around 3200; very few people achieve anything higher than this. The highest ever score is 3560, which is only one 10-point increment higher. He also ranked in the top 2% of people sitting the BMAT exam. As a result, he has been interviewed at all four of his choices and already received offers from Oxford, Birmingham and Newcastle (whilst waiting on Bristol). Aside from Oxbridge, there are many other top establishments that students have gained conditional places from. 138 students have applied to University and many have already received offers from all five of their choices. 8 of the successful candidates: Laura Green (PPE), Ted Wynne (Architecture), Justin Chan (Liberal Arts), Luke Gribbin (Medicine), Molly Acheson (Archaeology & Anthropology), Allèn Tomy (Economics & Management), Domokos Szarka (Experimental Psychology), Kyle Dearson (Engineering), Alex Still (History). Ewan Gribbin (not pictured, Engineering).